Staircases are often overlooked when considering decor. This is despite the fact that in many homes they are the first thing that people see when they walk in the door. It is important to create a grand entrance to your home. You can create that all-important good first impression with a brand new carpet in a fashionable shade. 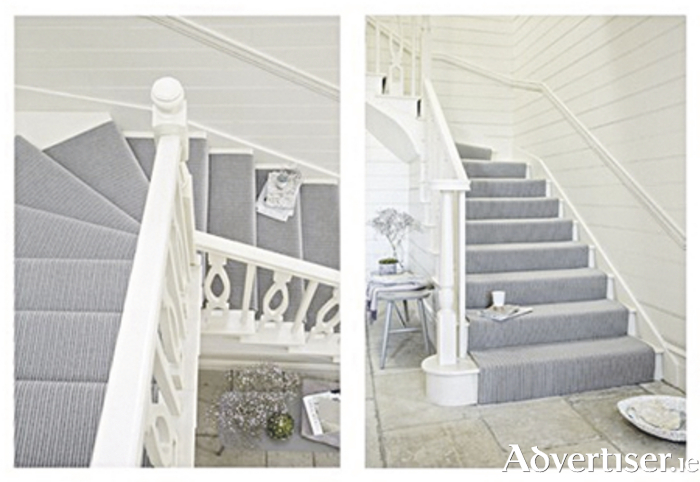 If your hallway and staircase is an open and airy space, why not let a striped carpet take centre stage? Comar’s Avebury collection, made from 100 per cent pure new wool, comes in either a neat, level loop or textured loop pile and offers four tonal striped designs and eight plain, stylish shades that can be teamed together to work in the hall and up the stairs. Keep the decor classic with a light striped carpet teamed with soft neutral walls for a timeless feel. Cormar Carpets are available nationwide. For more information call (01 ) 756795374. Page generated in 0.0890 seconds.